Mini Beauty Haul And Review. 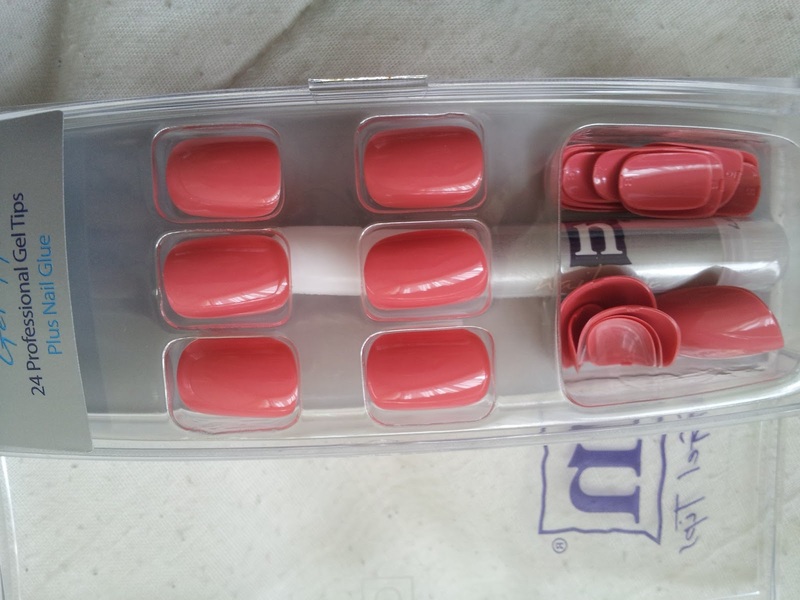 My weakness to a cheap beauty store! Hello lovelies, so I previously mentioned in a post that I was going to my boyfriends for a week. I am now back at home, and there's one thing I have to say other than I miss my boyfriend already (Soppy I know :P) is that I done a bit of shopping. 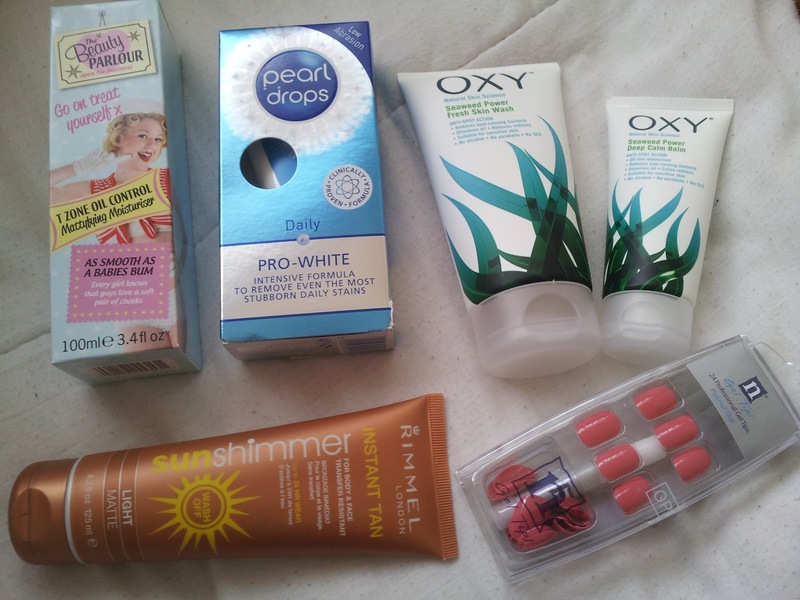 The day before I left for my boyfriends, I popped into my local shopping centre to pick up a few beauty bits. All these beauty bits came from 'Savers'. 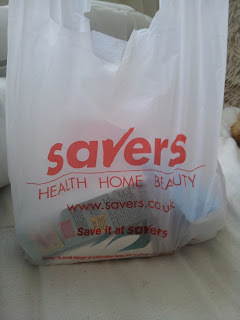 As far as I'm aware, Savers isn't a well known shop, but basically it's a beauty store sort of like Superdrug's and Boots but a whole lot cheaper but with all the same high end brands. So how could I resist not buying a few much needed and not so much needed but guilty pleasure things. Beauty Parlor T Zone Oil Control Mattifying Moisturizer, Pearl Drops Teeth Whitening Toothpaste, Oxy Seaweed Face Wash, Oxy Seaweed Face Balm, Rimmel Instant Tan, N Nails Gel False Nails. I saw this a while ago and instantly thought "It's a cheap version of Soap and Glory". 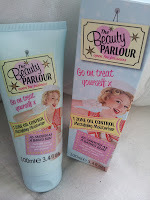 I felt hesitant at first but thought, it's about 3/4 of the price of Soap and Glory, just give it a go. So I did. And at £1.99, I'm not complaining. I suffer a fair bit with oily T Zone due to having combination skin. It claims to fight shine, blemishes and clogged pores and claims to give lasting shine control throughout the day. This moisturizer contains Witch Hazel, Neem and Quassia Bark extracts. This is more of a gel based moisturizer which I adore as I don't really like cream based products. I put this on my face and neck after washing or just before applying my make up and I love the results. My face feels fresh when on and doesn't feel like it's heavy on my face either. I do recommend this if you suffer with an oily T Zone. 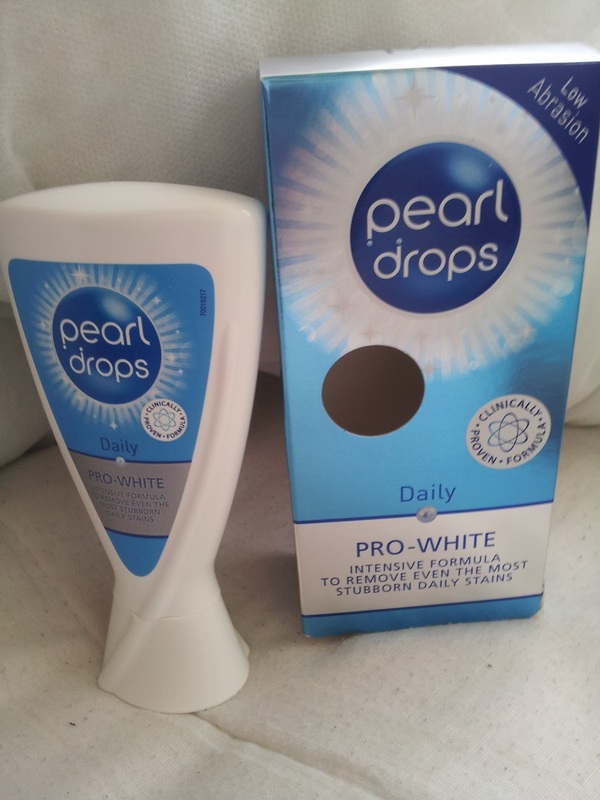 I've been on the quest to find the best toothpaste for whitening teeth, I've tried a fair few but have always gone back to Colgate, but I recently read up on reviews on Pearl Drops so thought id pick it up and give it a try. So far, so good. 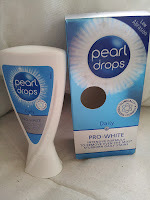 Pearl Drops claims that this is clinically proven to remove stains from tea, coffee, red wine and smoking. I love tea and red wine, so this seems perfect for me! The only issue I have, is to me it doesn't have a minty after taste, so my mouth doesn't feel as fresh and clean. Nothing a good ol' mouth wash can't change. Other than that, I'm looking forward to seeing how well this will work after a while. £1.99. I haven't heard of Oxy before, but I wish I had. I had visible results within two days, which is normally impossible for me and my stubborn skin. I picked these up for £1.99 each, and as they're so cheap, I thought it would be a good buy to try out something new. 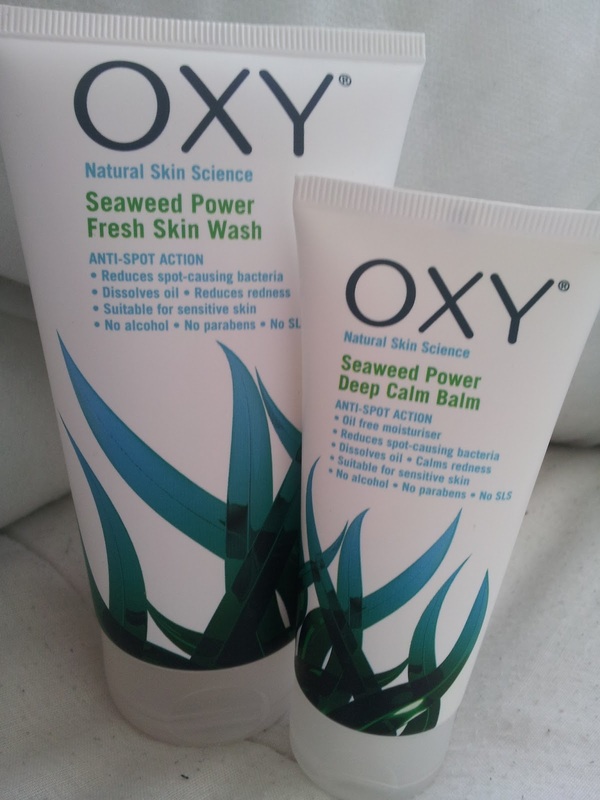 I read up about Oxy after buying this, and this is one brand that has been recommended by Dermatologists. It is specifically for acne prone skin, it claims to reduce spot causing bacteria, dissolves excess oil production and reduce redness. It's free from alcohol, parabens and SLS. This works a treat and has become my favorite face wash and balm. I find Clearasil and Clean & Clear is too harsh on my skin. Whereas this is gentle on the skin and feels truly fresh and clean after use. 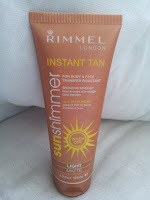 I have been using this since 2011, well when I go out in the evening for meals and clubbing, as I am super pale! (I make white sheets look tanned!) I haven't tried any other instant tan as I love this one. It blends in so easily and the light shade is perfect as it just gives a glow of a healthy natural tan. Even when applied with fingers, you don't get an awful streaky line and dries quickly. Plus the smell isn't as powerful as some of the tans. This only cost me £3.89 which made a nice difference to the £5+ I would usually pay. I have yet to try this item, I'm saving them for a night out with the girls. But as soon as I saw these, I couldn't help but want to buy them. 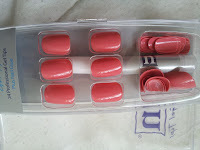 They were £1.69, which I couldn't grumble about as false nails can get pretty expensive. I'm not usually a false nail sort of girl, but I have a bad habit of picking my nails. (I know it's a vile habit!) So hopefully having these on for a couple of days will stop me from attacking my nails. If anyone has tried these, please let me know how you got on with them! So altogether in Savers, I spent £13.54 which saved me a fair few pounds. I will definitely be shopping in Savers more now. Especially as they also have Maybelline and Rimmel make up in there on the cheap! My poor bank account will feel the wrath of Savers from now on! What's your favorite cheap shops to get your beauty products from? What do you think of these products if you have tried them? savers is such a great store and theres sometimes so really good finds in there too!! Yeah, definitely do! There's so many good reviews for it on Google. Glad I picked it up, and I think my face agrees with me haha.